David Rittenhouse, a colonial American astronomer and instrument maker, was born Apr. 8, 1732. Rittenhouse is not so well known as his scientific contemporaries Benjamin Franklin and Thomas Jefferson, but he was certainly their equal, especially in matters mechanical, and together they made a formidable American trio. Rittenhouse lived in and around Philadelphia his entire life. In 1770, Rittenhouse built an orrery, a mechanical device that displays the positions of all the known planets (6 at that time) and their satellites. 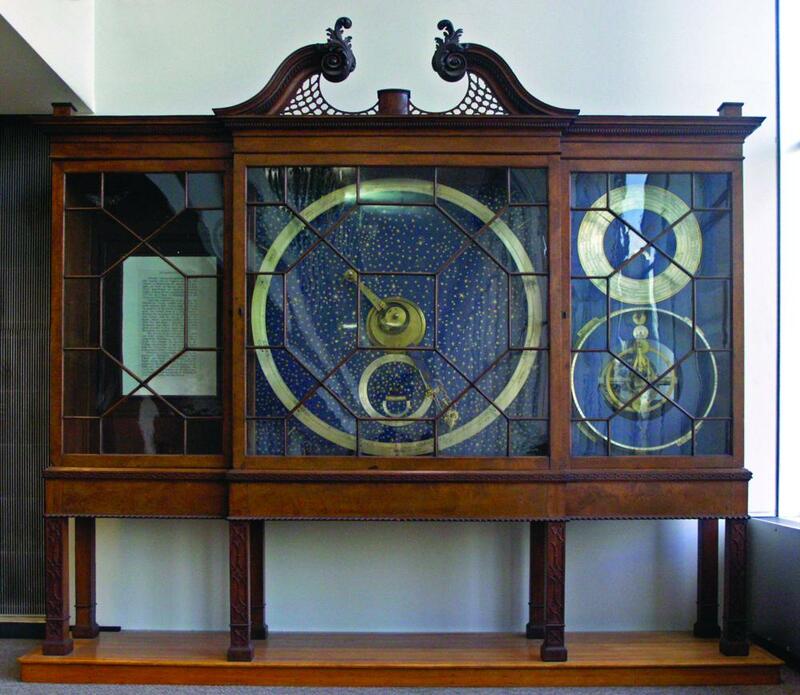 He sold this orrery to the College of New Jersey (now Princeton University) in 1771, to the shock of local Philadelphians, and he was prevailed upon to make another for the local College of Philadelphia, later to become the University of Pennsylvania. Both are marvels of mechanical ingenuity; both survive and can be viewed on their respective campuses today. The Rittenhouse Orrery at Penn has a relatively placid history. It has basically stood on the campus since it was built, and is now in the Van Pelt Library and still housed in its original Chippendale-style case (first image). A detail shows the delicacy and beauty of the mechanism (second image). One might surmise from the lack of visible lubricant that the wheels of this mechanical microcosm have not turned in quite some time. The Rittenhouse Orrery at Princeton has a more interesting story to tell, because of its walk on the wild side. It was initially the jewel of the Princeton Library (they had as yet few books), but it was damaged by continental soldiers (whether British or American is debated) during the Revolutionary War, and it fell into disrepair. It was put back into working order between 1804 and 1807 and used as a teaching aid, but then it was again neglected, and the next we hear of it, it was being shipped off to the World’s Columbian Exposition in Chicago in 1893 for public display. After the fair was over, it was crated back up and returned to Princeton, where it disappeared. For fifty years, no one knew what had happened to the orrery. Finally, in 1948, it was discovered in a building basement, still in its crate from Chicago. The instrument was again refurbished – actually, rebuilt would be a better term, since so many parts were missing – and motorized as well (some of the damage to the clockwork had been the result of turning a mechanical crank). Only the central panel was recovered, so it is quite bit smaller than the Penn orrery. The restoration technician was Harry Ashworth – his name is right there on the front of the clock – and I hereby claim him as a relative. By 1954, the Rittenhouse Orrery was back on display in the Princeton Library (third image). In 1966, it was moved to the newly constructed Peyton Hall, where it still stands today for all to admire. Rittenhouse not only has two surviving orreries, but he has two surviving portraits by the great Philadelphia portrait artist, Charles Willson Peale. Both are splendid, and since we couldn’t choose between them, we show them both. The first in point of time, painted in 1791, is in the American Philosophical Society in Philadelphia (fourth image). Five years later, Peale snagged Rittenhouse again, and the result of this second encounter is on display in the National Portrait Gallery in Washington, D.C. (fifth image). We featured Peale as our Scientist of the Day three years ago.